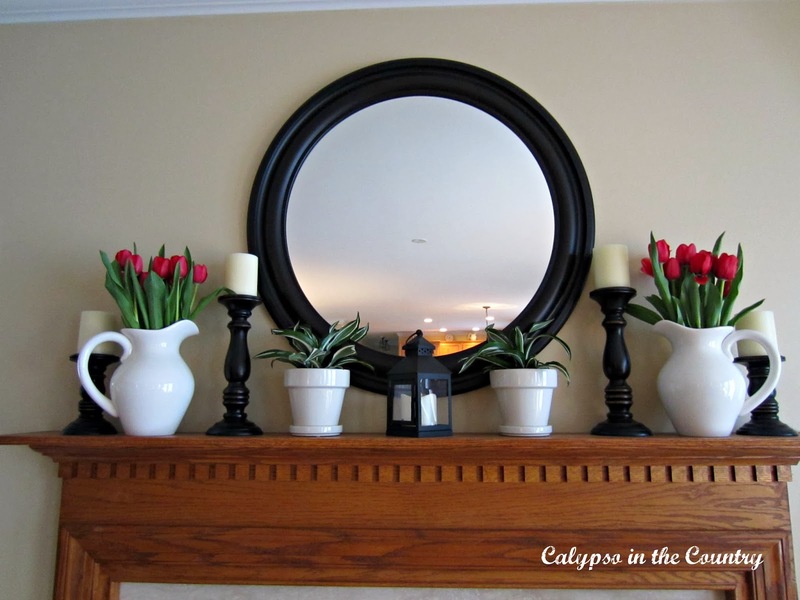 Tulips…I just can’t get enough of them and I love to decorate with them. Although they don’t last long, I just can’t stop myself from buying them this time of year! They are a simple and inexpensive way to update a room for spring. 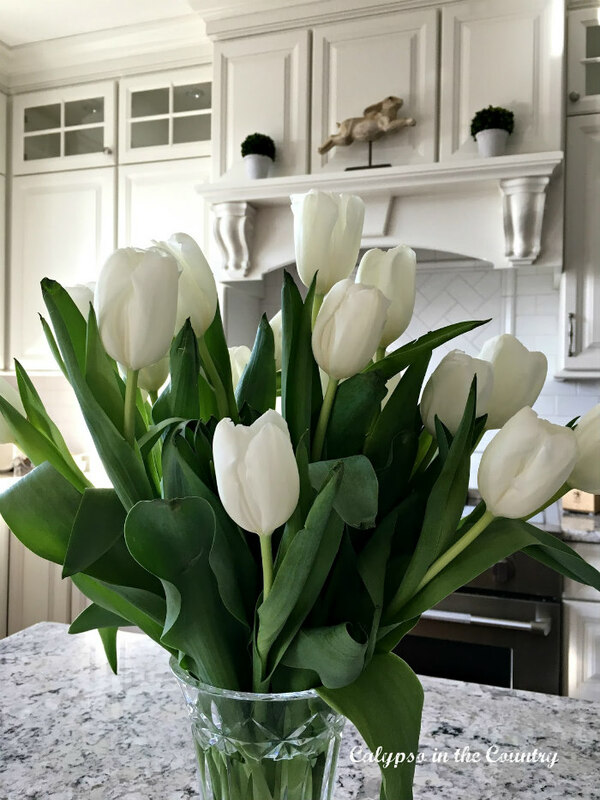 Since I don’t overdecorate for holidays, I love the way these white tulips contribute to the little bits of Easter decor around my house. And I really do mean “little bits” when it comes to Easter decor! You can see my three little ceramic bunnies up on the mantel in the background. Yeah, those and the kitchen bunny are almost all I use…simplicity. 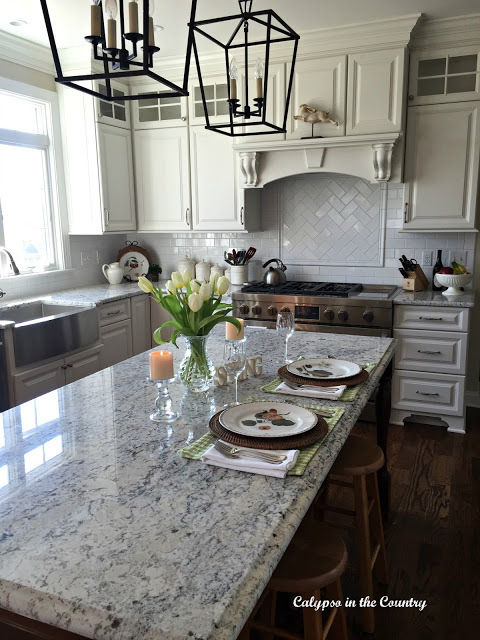 Just a simple vase of flowers is all I need to brighten up the kitchen island for spring. This towel I bought at Homegoods pretty much says it all! 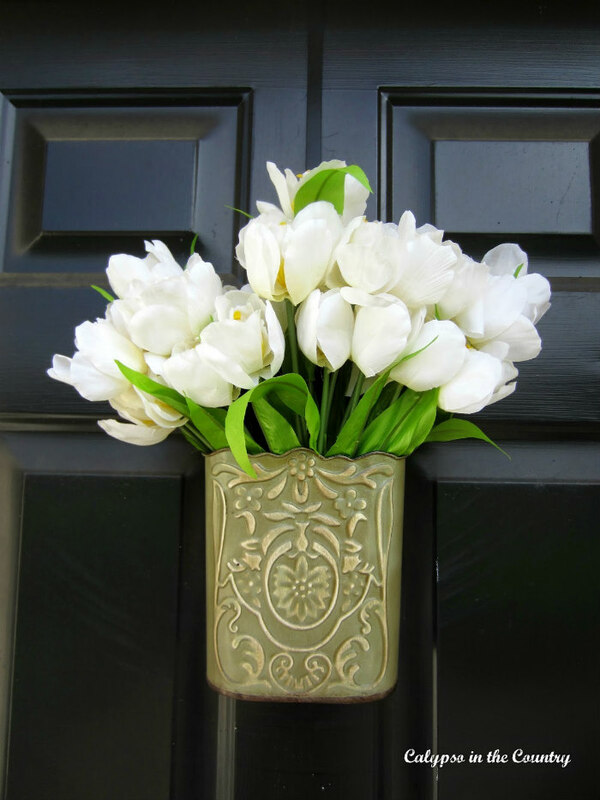 And what better way to welcome guests to our “home sweet home” than with tulips hanging on the front door. Obviously, these are faux ones but they still provide a warm spring welcome…and they will last all season! Although the white tulips are probably my favorites, I have used more colorful ones on occasion. 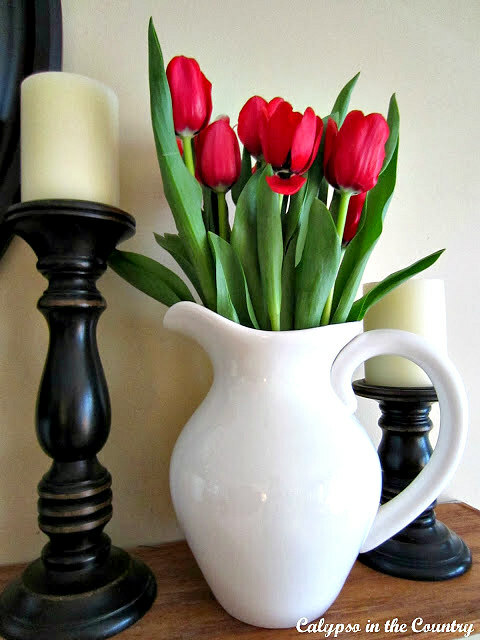 Plus, I have always loved using pink tulips with navy…such a cheerful color combination. I use my crystal vases all the time. They are probably my most used wedding gifts! The red ones work well during the Valentine’s to spring transition. We can all appreciate a vibrant color to brighten up those dreary late winter days! My foyer is another place I like to put a vase of tulips. Once again, I bought white ones but those tulips were starting to droop down a bit by the time I took the picture. **Helpful tip: Someone mentioned on Instagram to put a penny in the water. Recently, I tried that with my latest tulip purchase and so far, so good! Really, I will do anything to keep them fresh longer! Apparently, the shape of the vase seems to help too. On this vase above, the top is wide so I think the flowers tend to fill out a little faster. Obviously, I seem to go for the same look each year…this was last year’s spring counter setting. Either way, I never get tired of tulips in the spring! 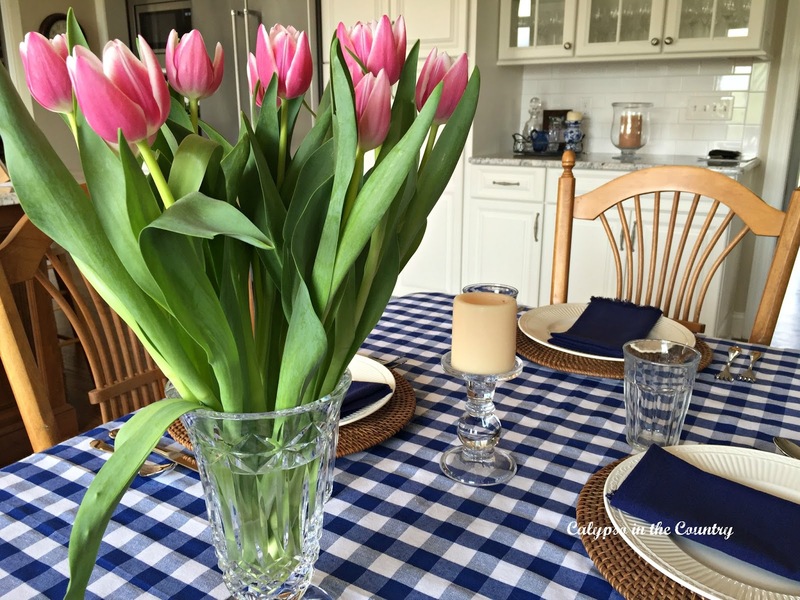 If you want even more tulip decorating ideas, swing by my more recent tulip post, Spring Tulips on a Colorful Easter Table. 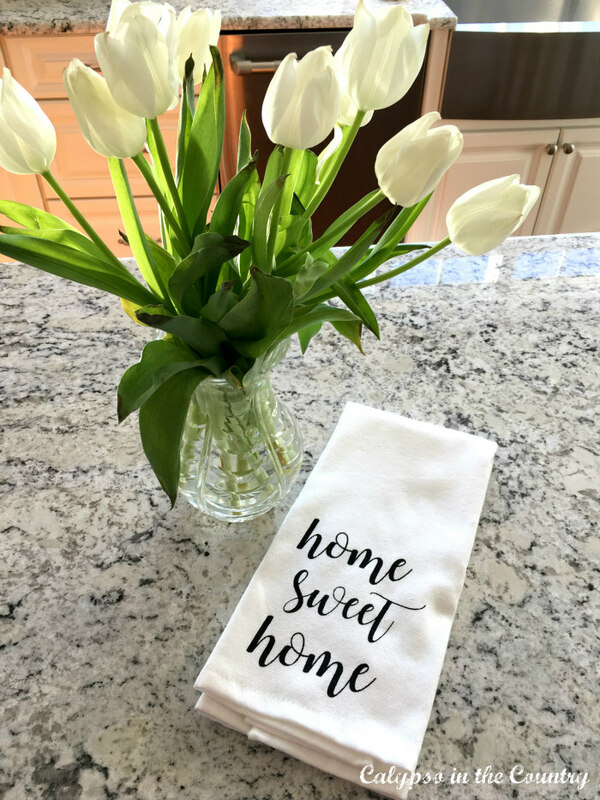 For decorating ideas using other flowers, don’t miss my post, Flowers on our Minds – Decorating and Gardening Inspiration. 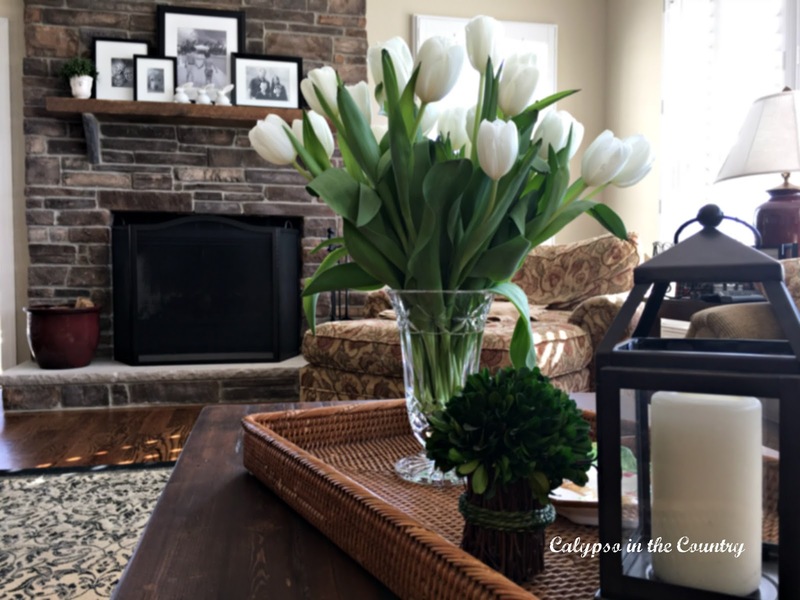 Are you decorating with tulips this spring? Please note the following recommended products are affiliate links. If you click over and purchase something, I will receive a small commission at no additional cost to you. Previous Post Help Me Plan My Trip to Martha’s Vineyard! This looks so fresh for spring! As the years go on, my holiday decor seems to be getting more and more simple. I'm adding tulips to my shopping list! have a wonderful weekend! 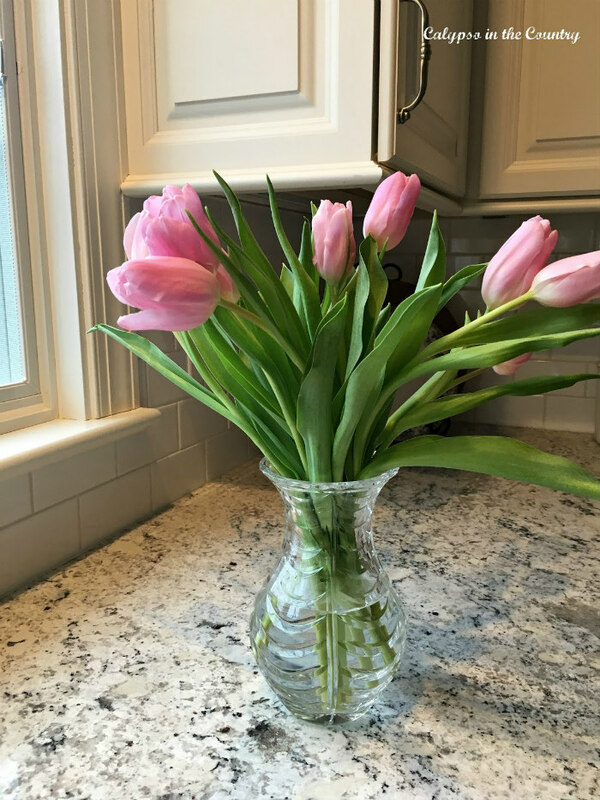 Shelley, tulips are the perfect spring flower and you can never go wrong with white or pink! Happy weekend! Love white tulips. They look great in your pretty house. Have a great weekend, Shelley. Beautiful. I usually just pick flowers from our property to display inside. It's slim picking right now as I'm still waiting for the daffodils to be in full bloom. My favorite spring favorite is probably lilacs from our bushes. I absolutely love their fragrance, but they don't make it in a vase past a couple of days, unfortunately. Tulips are always a winner in my book. You've used them beautifully around your home. I bring tulips home frequently. Love the look! You make me want to go out and buy a bunch of tulips for my kitchen table. I also love them. Tulips, daffodils, and hyacinths are the perfect spring flowers. 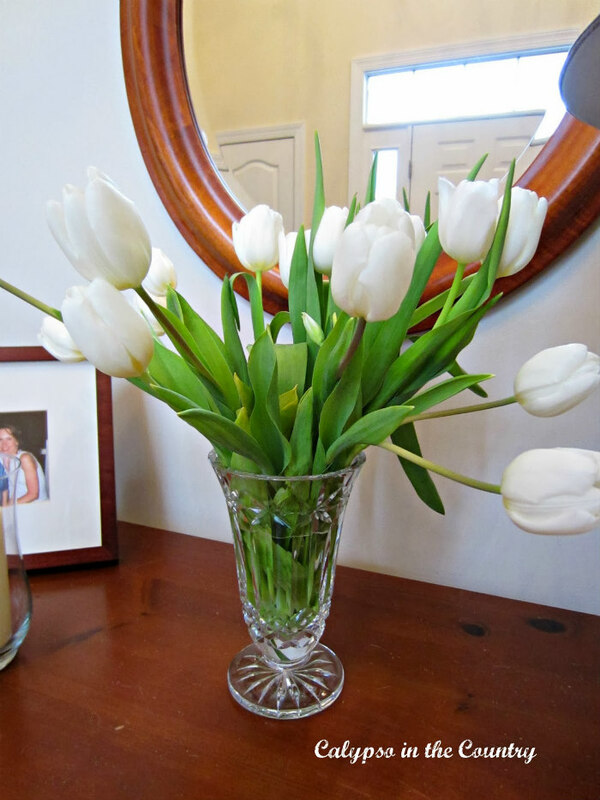 Your tulips add a fresh breath of spring to your home. Very pretty! Just gorgeous. 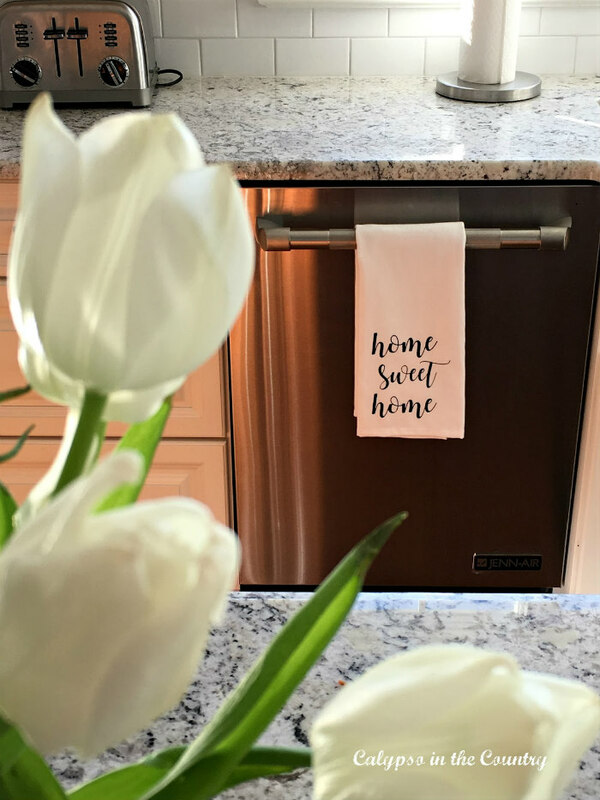 Your home is lovely…especially with tulips. I want some! Your tulips are exquisite! Your home is so inviting. I want to scroll through again. Lots of eye candy! Tulips just scream Spring to me! Yours are beautiful. I love tulips! My wedding bouquet was made out of them and the florist warned me they wouldn't last long but I really didn't care as long as they lasted long enough for the pictures. They're just so simple, clean lined, and happy feeling. Pinned.